200 Endgame Problems: Winning Tactics by Shirae Haruhiko is a collection of endgame problems split into two sections. The first section entitled Basic Problems and Application Problems. Techniques that should be learned from the Basic Problems section are further elaborated in the Application Problems section. One focus of the book is using sacrifice stones to change a local sequence from gote to sente. Focus on endgame tesuji. Its strong point is that many of the shapes shown are realistic; similar or even identical positions might appear in amateur games. The book is not a discussion of endgame theory and does not provide an explanation of sente, gote, and double sente endgame sequences. That material should be learned elsewhere. Neither is the book a guide to counting in the endgame and how to determine the proper order of the various endgame sequences to be played. Both of these questions are handled in detail in The Endgame. This book works well in conjunction with The Endgame and Get Strong at the Endgame. Publisher's blurb & sample pages. Problem 3. Black to Play. This is a position that occurs often in actual play. Find the flaw in White’s setup and steal some points. Javaness: It seems like the endgame is the most under-studied part of the game. If your endgame is strong, though, you'll win a lot more often. This book gives good practice in endgame tesuji. Good for single digit kyu and stronger. Axel? : In contrast to the previous review, I don't think that the actual tesuji are the best part of this book. I rather recommend it because it exposed me to several aspects of the endgame that I was not aware of (I've read The Endgame before). Yes, the tesuji are good to know and I already encountered problem 1 in one of my games. Yes, the problems are well-ordered and really hammer a few basic endgame techniques into your head. However, the problems also repeatedly tell you that the value of an endgame move is not solely determined by how much territory is gained and by whether the move is sente or gote. Moreover, the problems explain how approaching an endgame situation is different from a life&death problem. Finally, Shirae Haruhiko is an excellent writer. I'm so sick and tired of the dull and emotionless tone of most problem books (e.g. 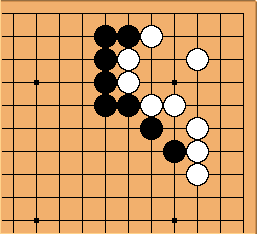 "Black to kill" or "What is the best way for Black to reduce White's territory?"). Shirae Haruhiko, well, pursues a different approach; just take a look at the sample pages.